A significant share of waste edible oil and fat is exported to the EU for processing into biodiesel. The indicator shows annual amounts of waste edible oils and fats generated and collected, as well as methods of their recovery. Waste edible oils and fats represent a fraction of municipal waste with the classification number 20 01 25. The management of waste edible oils and fats (hereinafter: waste edible oils) generated by kitchens in the industry, trade, service, education, health-care, public administration and other sectors is defined in the Rules on the management of waste edible oils and fats (Official Gazette of the Republic of Slovenia, no. 42/04). Among other provisions, the Rules stipulate that waste edible oils cannot be mixed with other types of waste, released into the municipal sewer system, septic tanks or directly into water, nor can they be discharged on the soil surface or underground. To separate edible oil from other fractions of municipal waste and ensure recovery. Following the adoption of the Rules, annual reports were compiled for 2004 and 2005. Data provided by the Environmental Agency of the Republic of Slovenia suggest that the quantity of waste edible oils and fats generated and collected has been rising slightly. A large portion of waste edible oils is exported to the EU and processed into biodiesel. The production of biodiesel on the industrial level requires an environmental protection permit as stipulated in the Decree on activities and installations causing large-scale environmental pollution (Official Gazette of the Republic of Slovenia, no. 97/04). So far, no permits have been issued for the production of biodiesel from waste edible oils in the Republic of Slovenia. 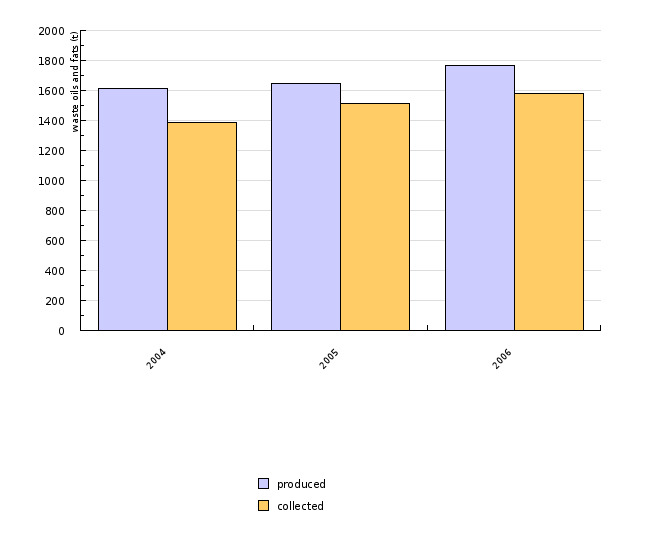 Data by the Environmental Agency of the Republic of Slovenia indicate no significant changes in the quantities of produced, collected and recovered waste edible oils. 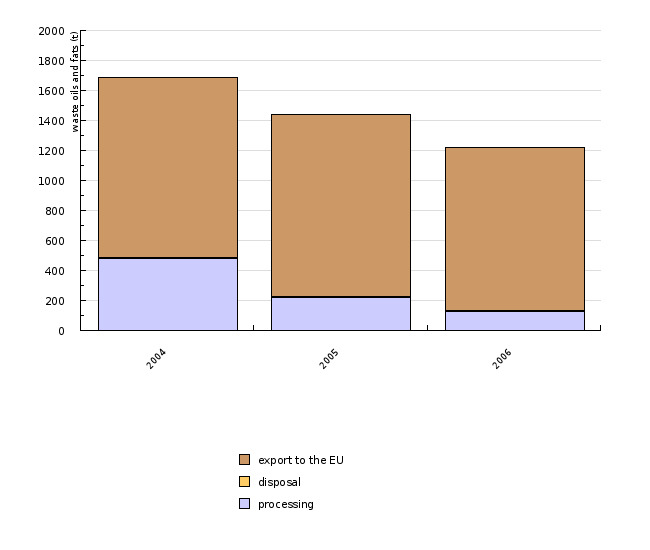 The most common type of further handling continues to be the export of oils to other EU members. In addition, records kept by the Environmental Agency of the Republic of Slovenia show that no production of biodiesel from waste edible oils on the industrial level takes place in Slovenia. - landfill operators, who submitted reports on landfilled organic kitchen waste. The content of each report is examined and, in the event of any discrepancies, verified with each liable entity. All data are entered into the database.